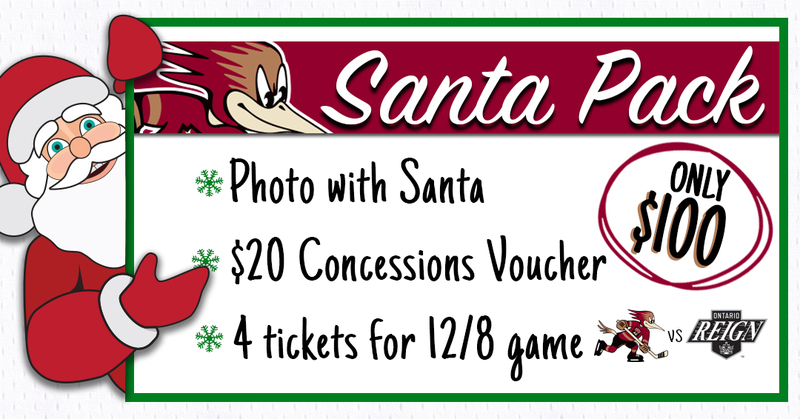 TUCSON, AZ – The Tucson Roadrunners, proud American Hockey League affiliate of the Arizona Coyotes, shared information today on the club’s “Roadrunners Santa Packs” which are on sale now. For just $100 the package includes a family four pack of four tickets to the club’s game on Saturday, December 8 against the Ontario Reign, a $20 food voucher and a professional photo with Santa. December 8 is also the Roadrunners Teddy Bear Toss Game presented by iHeartMedia, in which all fans are encouraged to bring a new plush or stuffed animal to throw onto the ice after the Roadrunners first goal. The toys will then be collected off the ice and given to Aviva Children’s Services, who will then donate them to Southern Arizona families in need this holiday season. Packages can be purchased at this time by calling 866-774-6253 or by clicking HERE. Following two wins last week the Tucson Roadrunners remain in second place within the AHL’s Pacific Division at 11-5-1-1. Surging rookie Brayden Burke has brought himself to the forefront of attention, recording three goals in two games over the weekend, including his first multi-goal performance in Saturday’s win over Bakersfield. The team returns to the ice again Sunday in Ontario for a rematch against the top affiliate of the Los Angeles Kings.